It has been a wild ride for the past nine months since the last post. Now we are nearly at the end of 2018. I am delighting in an end-of-year break from the action (and I hope many of you have downtime for the holiday season as well). What does that mean besides spending time with family and friends? That it’s time to game! 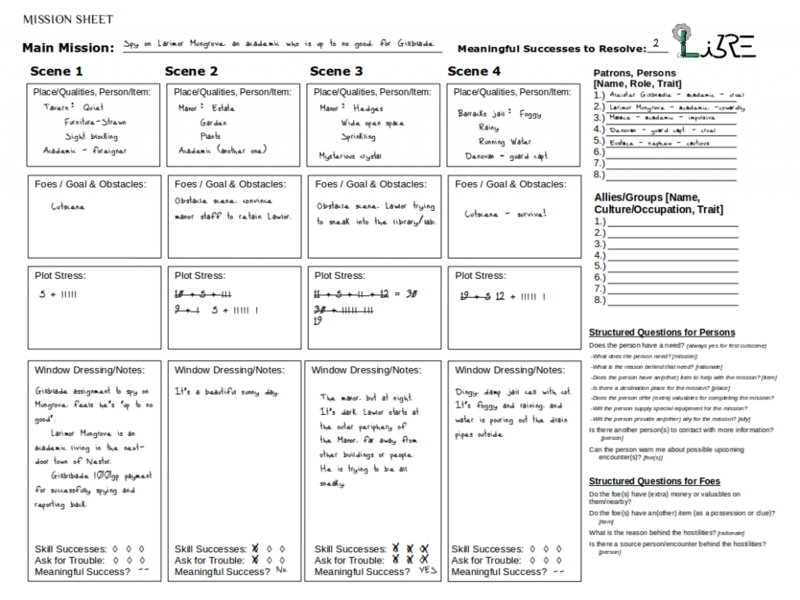 Such a long time ago in 2018, I promised to show an example what a Libre SRP Mission Sheet looks like when it is filled out. To make it happen, I decided to bring in as a guest RPG Flying Buffalo Inc.’s Deluxe Tunnels & Trolls. The session I played ended up being all about intrigue between two wizardly academic types in neighboring towns, Aleister Gillbladle and Larimor Mungrove. Social investigation and intrigue isn’t T&T’s strongest suit. Its roots are deeper in deadly dungeon crawling. But the system stepped up to the task. As for our hero, Lawlor the Bold, he might have learned that dungeon crawling is a safer option than getting in the middle of a spat between academics. Below is an image of the first page of the mission sheet from the game. Here is a PDF of the full mission sheet for the adventure, and here is a (off-the-cuff and rough) write-up of the game session. I may have cut a corner here and there and tweaked one thing or another to keep up the game’s pace. In the end it all worked out. To explain the lack of updates lately, I’ve been away on international travel the last 10 days. After two days at home, I am re-packing my suitcases for a US trip. Sometimes life gets busy like that. I had a request to show what a filled-out mission sheet looks like. So I’ll be doing a transcribed game session as soon as possible that includes filled-out mission sheets as part of the game. In the meantime I’ve been squeezing in personal Libre SRP gaming time — no transcripts, just playing the game. Gortais has had several more adventures. After the two most recent stories, I’m happy to report he is still alive, though he failed one mission and had a positive outcome for the second. There was also a street-level superhero story where I experimented running a session with three player’s characters at once. I put Libre SRP through its paces, switching back and forth between the player’s characters after they split up from the third scene onward. The group failed the mission, but at least everyone managed to get out alive. I hope to have more for you all soon. To round out the other two powers appendices, here is the third and final power appendix, a random powers table. Use this if you need quickly to assign a couple random magic spells, psionic talents or a special ability to a foe or ally. I should also warn that this table has not been playtested, and it won’t always give hit-the-ground-running ideal results. The table refers back to the power trappings appendix and monster special abilities appendix for rules how to treat certain types of powers. It also gives some guidelines for types of powers that were not covered, or only partly explained in the previous appendices: Healing and resurrection, illusions, telepathy, control and possession, fear effects, and an array of summoning options. This table should make it easy to pick up percentile dice and make a couple rolls to create an instant NPC mage, talent or mutant. Add a d20 power trappings roll there may even be a central theme for the character’s collection of powers. Get the new random powers appendix directly here, or as always it’s also in the downloads page. It’s 14 February, which is both Valentine’s Day and Ash Wednesday. I’ve been mostly off regular social media haunts for several weeks now. Part of that has been work; part of it has been about carving out time for content I have been putting together for Libre SRP on this site. But there’s been another darker, more private reason. Even after the playtesting, I’d still been full of self-doubt. Libre SRP exists because it scratched an itch for me in a big way. But I was still completely in the dark whether others would find it too difficult, too tedious, or just too far out there. But for this confluence of two very different holidays, I figured this is the right time to face the music: share in the love or beg for forgiveness? 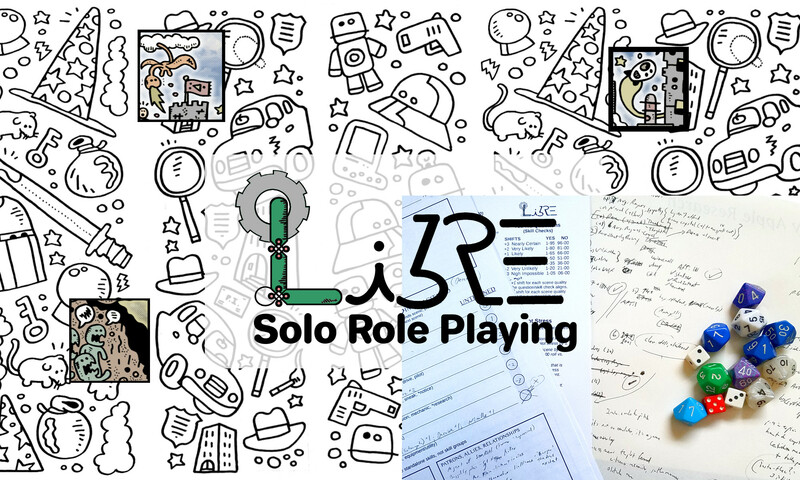 I headed to the source: Lone Wolf Roleplaying in Google Groups, a collection of solo RPG enthusiasts who are as expert as things get on this topic. For anyone who might not know this Google Group, it’s over here, and it is an excellent resource. If the Lone Wolf folks didn’t like it, then it’s time to throw in the towel for real. I’m breathing a lot easier now. Deathworks DW was kind enough to give his honest impressions and published a review of the book. I am both humbled and extremely grateful. His review is over here, and I would agree with pretty much everything DW says. (By the way on the topic of plot stress: When a yes-no question roll triggers plot stress, nothing is added. Just cut the current level of plot stress in half and round down. Also, add 5 points to plot stress at the very start of a new scene, before making any rolls; yes-no questions before the start of the scene add to plot stress and can trigger an unexpected event, even though the scene hasn’t been opened yet. These sorts of details aren’t critical to follow, but I should have spelled it out more precisely). I’m keeping my fingers crossed that over time there’ll be more examples both of conventional gameplay as well as homebrewed mashups. Reading these stories, I have a warm feeling tonight that the effort to get this e-book out was well worth it. Appendix 10 is done (and re-done). It covers 20 power trapping categories for melee and ranged attacks, from acid/chemical powers to water/ice powers. The power trappings appendix includes an introduction on how to use power category special effects; how powers can counter each other’s special effects; and additional conditions and restrictions for power categories. Get it over here, or from the downloads page. On a cautionary note, all the exceptions and possibilities get complicated. Don’t add this appendix to your game unless the cool outranks the additional complexity. As with power manipulations, it’s better to tread lightly on power trappings – a little bit goes a long way. Sharp-eyed readers will notice that categories like summoning and illusion, as well as broader necromantic powers are absent from the power trappings appendix. That’s because these categories aren’t direct attack powers. An appendix grimoire of sample skill powers and equipment/utility powers is in the works, but that will likely take a while. Combining power trappings and power manipulations? It works. Special effects on beasts/monsters? Covered. Now back to the monster special abilities appendix to re-revise the rules for restraining attacks. As it turns out that the original, nerfed version was the more correct way to do things after all. Fixed version will be up in a jiffy. The good news: The power trappings appendix is done. I hope to give it a final read-through tomorrow and make it available starting Sunday 11 Feb. The ok news: It quickly became clear that the first version of restraining attacks (in the monster special abilities appendix) was nerfed. I’ve made tweaks that fix restraining attacks to the document in the downloads section. “Fix” might be the wrong word because restraining attacks are now more dangerous. But the monster special ability will now be in line with how similar effects work in the power trappings appendix. I’m making progress on the next of the planned set of extra appendices, covering common power trappings. The power trappings appendix will add options to spice up powers, suggesting common bonuses and penalties for melee and ranged attack powers, plus ways that powers counter and cancel each other. The power trappings won’t have been playtested for balance. But the Libre SRP way of handling group conflicts — basing effects off the member who leads the attack, with other participating members adding a +1 bonus — should keep the new rules from going too far out of whack. I’ve finished the first of three planned extra appendices. Chapter 14 leads with “rules for building monster encounters” (p.83), and has a sidebar that lists monster special abilities. What do those sample monster special abilities do? That was left up to the player. As always, you can also find the file in the downloads section. It may have one or two errors — will bugsquash errors and upload fixed versions as I find them. One post-book appendix down, two to go. At least for what I feel are the interesting extras that didn’t find their way into the book. I also wanted to take a moment to thank all of you sincerely who’ve gotten the book so far. I used to be frequent lurker on several social media groups related to solo RPGs. These past few months I’ve been pretty much absent. Spare time goes towards supporting content. Questions, comments, criticisms… please reach out to me on the contact page. I want everyone who has put up their hard-earned money for this product to be reasonably satisfied with it. Next project is to pick up the “Sutton Farm” horror mystery gameplay example with Marvin Peele’s sister Kristen. I’ll focus this next example at a different level of gameplay — the middle layer of the logic & thought process around yes-no questions and skill checks, instead of top-level storyline or underlying game mechanics. On Sunday I managed to sit down and play a nice, long session for a change! I decided on a storyline to follow up on my last post about running a mystery or mystery horror. The setting: mystery horror in a southeastern US university town. I did a bunch of things differently for this story. First, I only wrote down the game mechanics, with a storytelling summary at the end of each scene. I didn’t write down the odds for any of the rolls. I also didn’t use the Libre RPG ruleset, but instead hacked together an external d20 variant. One other real important thing I didn’t record is the setup for each roll. Know what’s at stake – what yes or no mean, or what happens with success and with failure – before making the roll. For each yes-no question, I had at least a general idea what yes and no meant before picking up the dice. That’s why in some cases you’ll see a line that says: “No. (Interpret as… )”. This is the alternative answer I had for “No” in advance of rolling. Sometimes I had more than one alternative answer so I’d ask a second yes-no question, and on another no invoked the “Rule of Three”. When the yes-no question result was “Yes”, I didn’t bother to write down what “No” could/would have meant. When a skill check returned success, I didn’t write down the possible consequence(s) for failure I had in mind. Here’s the irony: I have the 3 meaningful successes that I set out to get for a positive outcome to this story. But I don’t see a way to keep Marvin alive and get him to escape in the mandatory follow-up scene. Anyway, I love having some the time to play again, and hope gradually to add more and more, different formats of gameplay examples over here. If you have something to submit, contact me via the form on this site, send it on over or send me a link!